The miniaturization of unit operations. Smaller unit operations mean less size, less weight and less structural steel, piping, conduit and wire. This means lower cost plants with smaller footprints. We review your process, sort through the process data, review technical information, and gather specific data to your chemical reactions including kinetics. We then recommend suggestions where Process Intensification (PI) would be beneficially applied. This includes reactors, distillation units, extraction units and heat exchangers. We perform audits on both new and existing processes. We then work with you and our licensors to develop a pilot or test program for your process. This testing should identify the degree of intensification that can be reached. We prepare intensified Process Flow Diagrams, Piping & Instrument Diagrams, equipment specifications and detailed process descriptions. After the front-end engineering package has been completed, a Cost Estimate of the intensified process can be provided. Civil, structural, mechanical and piping are carried out at this stage. Equipment supply is usually provided by our licensors and this includes bench scale, pilot plant and full size equipment. Approximately 20% of the cost of a new plant is process equipment with the balance being structural steel, piping, conduit, wire and instrumentation. Smaller unit operations mean less size, less weight and less structural steel, piping, conduit and wire. This means lower cost plants with smaller footprints. In addition, many plants are amenable to skid mounted construction, which can lower costs even further. One of my recent articles entitled “Process Intensification: Think Small” provides a more detailed description of process intensification. This article has been published in numerous magazines. The link above will take you to be article as it appeared in Chemical Engineering magazine in April 2004. Reactors The heart of the Chemical Process Industries is the reactor and until recently, process intensification technology did not exist for reactors. 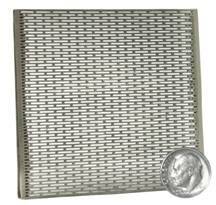 Today, we have reactors that are the size of a ‘credit card’ calculator, look like a 12 inch piece of small pipe or resemble a high shear mixing device. 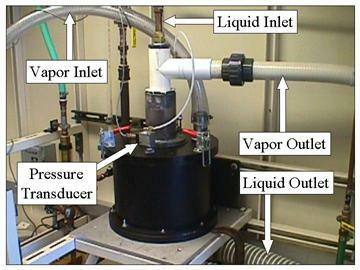 Reactor on left is International Mezzo Technologies’ microchannel reaction system. Reactor on the right is R.C. Costello & Assoc., Inc.’s reactor model # CFR-T.
COSTELLO’s reactor model # CFR-T. This reactor resembles a 12 inch piece of small pipe and was featured in the May 2004 issue of Chemical Engineering magazine shown below. Supercritical single-phase hydrogenation is a technology that can improve product quality to levels previously impossible while reducing reactor size by a factor of at least 100. In addition, the costs for a process using this new technology are less than those for traditional batch hydrogenation. Therefore, we anticipate that supercritical single-phase hydrogenation technology will be used extensively in a wide range of industries such as pharmaceutical, fine chemical, food, surfactant, and petrochemical. Härröd Research is a company whose aim is to develop supercritical single-phase hydrogenation technology from a basic patent to industrial processes in co-operation with industrial partners. Large amounts of power which are expended to merely recirculate large liquid volumes in stirred tanks although only the shearing areas of the impeller blades impart most of the useful work for mass transfer. Unwanted side products in reactions due to inadequate thermal control or hot wall effects. Costello reached an agreement with International International Mezzo Technologies of Baton Rouge, Louisiana to collaborate on microchannel reaction systems. Mezzo is an offshoot of the MicroSystems Engineering Team Laboratory (µSET) at Louisiana State University, which over the years has attracted millions of dollars in federal, state, and industrial support for research and development of new micromanufacturing technology. Mezzo’s core focus is merging thermal science and micromachining technology to form revolutionary thermal systems. Applications for this technology include: high power electronics, cryocoolers, radar systems, directed energy weapons, turbo machinery, fuel cells, pumps, thermal management, power systems, chemical reactors, and many other products. In addition, Mezzo provides design analysis, prototyping, and production services for RF, microfluidic, optic, magneto, bio-analytical, and electronic devices. Some new and exciting work currently being done by Costello involves exploring new ways to utilize existing process equipment as chemical reaction systems that will achieve process intensification goals. To meet our internal requirements and be cost effective, equipment must reduce reactor residence time by at least two orders of magnitude. The most promising areas we’re exploring include homogenizers and inline high shear mixers. The trick here is to not reinvent the wheel and to keep our client’s installed costs down. 1,000 times that of gravity. Typical Higee installations are used to strip organics from wastewater. Future installations are expected to include various types of distillation and retrofits to existing columns. Removing a byproduct is one of the principles behind reactive distillation. The reaction mixture is heated. Then, the product and byproduct are separated by distillation. In this case, water is removed continuously to force the reaction to the right. 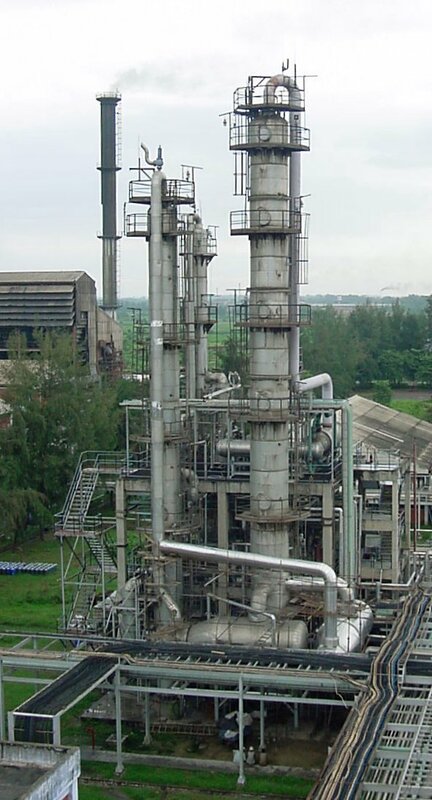 When done in a distillation column, the water byproduct comes off the bottom of the column and the product methyl acetate comes off the top of the column. We expect installations using reactive distillation to continue at a moderate pace in this decade. Costello offers extraction technology in the form of process intensification with the Advanced Phytonics technology. With their technology, the solvent, Freon 141B, is flash evaporated from the extract. This eliminates a costly distillation column and related auxiliary heat transfer equipment, pumps and process instrumentation. To further simplify and miniaturize extraction systems, a Podbielniak extractor can be used in conjunction with Advanced Phytonics’ technology. The Podbielniak extractor could be used to contact the solvent with the heavy liquid instead of using an extraction column. In this way, the entire process can truly be miniaturized. In the field of heat transfer, the Klaren BV self cleaning heat exchanger technology requires significantly less installed heat transfer area than traditional shell and tube heat exchangers. Since the Klaren units are self cleaning, there is no need to oversize your installation in order to compensate for pluggage. If you would like a quotation on a self cleaning heat exchanger, please complete the linked questionnaire and e-mail it to us. Another contender in intensified heat transfer technology is Alfa Laval with their Compabloc ® welded plate heat exchangers. These units have high surface area per unit of volume. Since a process intensified plant may require multiple miniaturized unit operations, it is more critical than ever to simulate a new plant design prior to construction. In this way, most of the pitfalls are handled in the design phase before they can occur in the field. Costello has created custom unit operations for these intensified pieces of equipment. 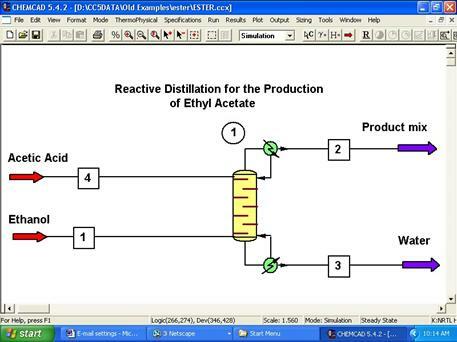 ChemCAD simulation screen showing a flow sheet of a reactive distillation system for the production of ethyl acetate. Costello creates process simulations of any chemical process that our clients need. These simulations allow unlimited “what if” analyses of a chemical process, quick modifications of an existing process to test an alternative flow scheme and/or simulation of all existing processes to aid in problem solving, troubleshooting, debottlenecking and equipment sizing. With reactors, columns, extractors and heat exchangers; all offering a Process Intensification alternative, the practicality and cost effectiveness of PI has become a reality. For further information on how we can help reduce your installed plant costs through process intensification, help you troubleshoot an existing plant or simply help you simulate your existing process, please contact us.